Doha, Qatar – November 7, 2018 – How mobile media are changing the communication landscape in the Middle East is explored in a new book published under a research grant at Northwestern University in Qatar. 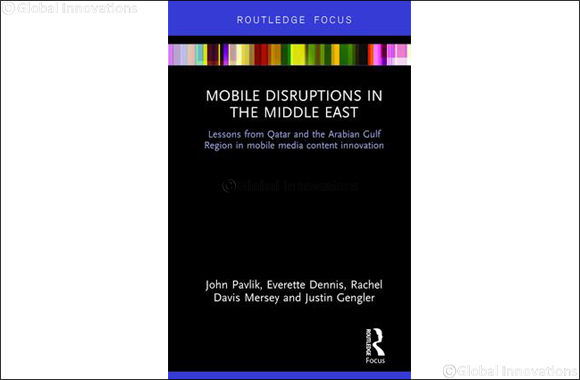 The book, Mobile Disruptions in the Middle East, co-authored by John V. Pavlik, Everette E. Dennis, Rachel Davis Mersey and Justin Gengler and published by Routledge, offers lessons from the Arabian Gulf, notably Qatar and the United Arab Emirates, and draws on data collected as part of a $726,000 award from the Qatar National Research Fund. Pavlik, a professor of journalism at Rutgers was formerly associate dean for research at NU-Q where Dennis is dean and CEO. Mersey is an associate professor at NU’s Medill School while Gengler is assistant research professor at the Social and Economic Survey Research Center at Qatar University.